Charles II the story of his escape. At the end of the English Civil War, King Charles 1st was executed by Oliver Cromwell at Whitehall on 30th January 1649, effectively making England a republic in all but name. In Scotland however the Scottish Parliament proclaimed Charles’ son, Charles II as king. In 1651 Charles II and his Royalist followers fought Cromwell’s Parliamentarians at the battle of Worcester on the 3rd September 1651, and suffered a heavy defeat in which at least 2000 Scotsmen were killed. Charles was forced to flee and seek refuge in France but his journey was to be far from easy. 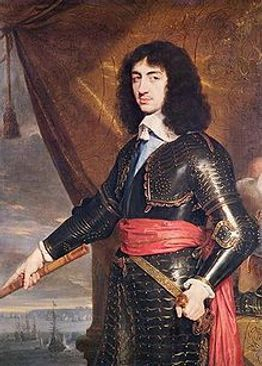 Charles II’s protracted journey from Worcester to Shoreham Harbour took six weeks with several close encounters with Parliamentary forces. As an enthusiastic walker our speaker, Chris, has walked all of the route piecemeal, but it took her eight years, walking sometimes with friends and sometimes alone. Her only close encounter being a pair of mute swans. The record of the journey taken by Charles was well documented, as the King himself told the story to none other than Samuel Pepys. The King with several of his closest supporters managed to escape Worcester through the northern gate and headed north. It was decided that the King would be better off travelling almost alone so the party split and went different ways. Lord Derby and most of the group left the King but were captured by the Parliamentary forces and Derby was beheaded. Charles continued northwards and eventually found shelter and safety in a sympathetic Catholic household at Whiteladies Priory, home of the Giffard family. Charles was an imposing figure standing at 6ft 2ins (1.88m) and had long hair. The average height of most men at the time was 5ft 10ins (1.78m). It was obvious that he would be recognised unless he changed his appearance. He changed clothes to look like a woodsman, had his hair cut and his face and hands stained with walnut juice. The King accompanied by Richard Penderell headed for Wales in the hope of finding an escape via the River Severn but all crossings were well guarded. They returned to the Boscobel area where the King and Major Carlis, a Royalist soldier had to spend a whole day in an oak tree while Parliamentary forces searched the woodland around them. The following day the King travelled to Moseley Old Hall where he was fed and had a change of clothes. From there he sought refuge in the home of Colonel Lane at Bentley Hall. The Colonel had a daughter, Jane Lane, who was planning to visit her sister at Abbots Leigh, near Bristol, who was about to give birth. At that time a travel permit was required which Jane had obtained, so it was decided that Charles would travel with her disguised as her servant. They reached Abbots Leigh on the 12th September where Charles had to stay locked in his room as one of the staff had served in his regiment and so would have been able to recognise him. The Welsh ports were being watched by the government so hopes of a ship out of Bristol was abandoned. Jane still accompanied the King to provide a convincing cover story. Next they ended up in Trent, near Sherborne, at Royalist Officer Colonel Francis Wyndham’s home at Trent Manor. Wyndham and another Royalist, Wilmott, went to Lyme and arranged for a boat to sail from Charmouth but unfortunately the boat never turned up. Charles returned to Trent Manor where he stayed for a couple of weeks while his supporters looked for a boat. On the 6th of October the King left for Heale House near Amesbury, the home of a Royalist lady Mrs Amphillis Hyde where he stayed for five days. From here Charles left for Sussex where a boat had been arranged. He spent his last night in the little village of Bramber and then travelled to Shoreham Harbour on Wednesday 15th October where he boarded a ship named ‘The Surprise’ at 4am and sailed to France where he was to spend the next nine years. Cromwell died in 1658 and Charles was returned to the throne in 1660 where he reigned until his death in 1685.